The wood finish on these banquette pieces are available in three finishes to match the tables, chairs, and storage pieces available from the Artisan's Shoppe Collection. Black Forest, Antique Caramel, or Tobacco bring three different sophisticated looks to your home. Upholstery fabrics are completely customizable in hundreds of options offered by Kincaid Furniture. As part of the fabric options, Kincaid offers Sunbrella Fabrics created to prevent fading, help with stain resistance, and offers easy cleaning solutions - you can even use bleach! It's the perfect choice for your dining room. 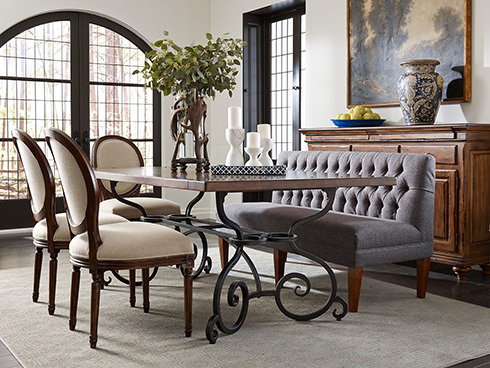 View these dining banquette options along with others at Belfort Furniture's showroom building #1. Browse our showroom for inspiration and choose the options that make the most sense for the way you and your family live. It's all about options and finding the perfect solution for you! We love creating beautiful rooms with you and these dining banquettes are sure to be a stylish look that's classic and will stay for years!